Funding: CORE Organic Plus Funding Bodies, being partners of the FP7 ERA-Net project CORE Organic Plus. You can follow @FertilCrop on Twitter at https://twitter.com/FertilCrop; Hashtag #FertilCrop. The Technical Note "Decomposition study using tea bags" from the FertilCrop project is now available in French. It was translated by the Chambre d'agriculture d'Alsace in Schiltigheim, France. 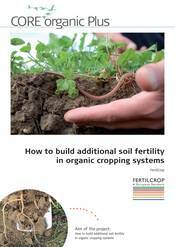 It can be downloaded from the Organic Eprints archive.